Last night i went to see Norwegian DJ Todd Terje, the man is a machine, a 6 hr set and most of the time he just plays edits that he did himself of songs, mostly that deep slow motion disco but with a lot of tribal elements which is always is a win-win situation for me. Brought out a old favorite, Nightmares on Wax, i think if you do graphic design and you’ve listened to lounge music at some point in your career, this is probably played as much as Thievery Corporation or Air. Grovesnor is a Hot Chip favorite, he toured with them in the UK, its kinda cheesy but has a great keys being played at the beginning and has a good feel to it. The artwork above is from Fleet Foxes, i woke up with the song playing in my head and i’ve only heard the song a couple times. The overall color when you step back look at their cover is really appealing to me, it reminds me of Monty Python’s Holy Grail but really crowded. Jonsi+Fleet Foxes.. Slum Village+Hudson.. Grovesnor + Pallers ..
Hello Scott, I sincerely believe your readers and you share similar taste in music and art. May I suggest you post future events that are worthy to attend and visit? – Thanks Scott. Fleet Foxes are sooo good. They remind of Crosby, Stills, Nash & Young. Have you heard Fleet Foxes’ “Blue Ridge Mountain” and “Mykonos?” Oh so good! It seems like there’s less and less people making music like this these days. I wish there was more. 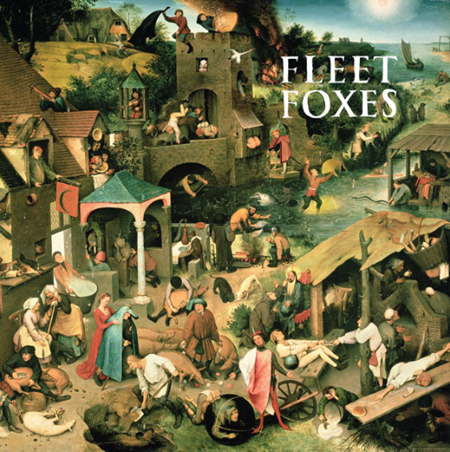 Isn’t that Fleet Foxes cover a painting by 15th century painter Hieronymus Bosch? The cover is a painting by Pieter Bruegel also known as Pieter The Elder.